For reliable and prompt delivery, MyFlorist & Exclusively Roses knows flower delivery in Bethesda MD and its suburbs like no one else - including: delivery in Maryland to Rockville, and Gaithersburg; and delivery in Virginia to Tysons Corner, Vienna, Arlington, Reston, Fairfax, and Burke. 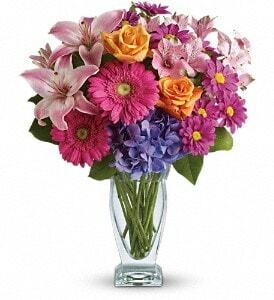 We are the experts when it comes to dealing with the difficult traffic and flower delivery in Bethesda MD. We also deliver to all Bethesda hospitals, churches and funeral homes. Bethesda is one of the most affluent and highly educated communities in the country, placing first in Forbes list of America's most educated small towns and first on CNNMoney.com's list of top-earning American towns. In April 2009, Forbes ranked Bethesda second on its list of "America's Most Livable Cities." In October 2009, based on education, income, health, and fitness, Total Beauty ranked Bethesda first on its list of the U.S.'s "Top 10 Hottest-Guy Cities". By the middle of the 18th century a small stone tavern had been built near a bend in the road, offering respite and replenishment to passersby. Situated near the northwest intersection of present-day Old Georgetown Road and Wisconsin Avenue, the “old stone tavern,” as it was familiarly called, was the first commercial establishment in the area—and the nucleus of what would become downtown Bethesda. Read the full article about Bethesda's history on Bethesda Magazine. Family owned and operated: MyFlorist & Exclusively Roses was founded by The Parker family and they continue to be there everyday to insure that each and every order is given complete care and attention. With a particular concern toward flower delivery Bethesda MD, we have earned the reputation as the “can do” florist. Robert A Pumphrey Funeral Homes, Inc.